The Yupik or, in the Central Alaskan Yup'ik language, Yup'ik (plural Yupiit), are a group of indigenous peoples of western, southwestern, and southcentral Alaska and the Russian Far East. They include the Central Alaskan Yup'ik people of the Yukon-Kuskokwim delta, the Kuskokwim River, and coastal Bristol Bay in Alaska; the Alutiiq (or Suqpiaq) of the Alaska Peninsula and coastal and island areas of southcentral Alaska; and the Siberian Yupik of the Russian Far East and St. Lawrence Island in western Alaska. 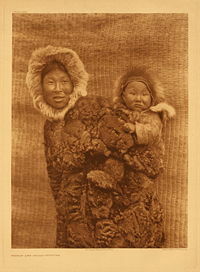 They are Eskimo and are related to the Inuit. The traditional way of life of the Yup'ik was semi-nomadic, following the seasonal variations in their environment. Hunting, primarily sea mammals, and fishing were subsistence activities. They also developed trade, initially with neighboring groups, and then with the Russians by the end of the nineteenth century. They believed that all living creatures go through a cycle of birth, death, and rebirth, leading them to give newborns the name of a recently deceased member of their community, and to practice rituals in which parts of animals that were killed for food were returned to the ocean so that they could be reborn. They practiced shamanism, recognizing that there are both benign and evil spirits; shamans being able to communicate with them. Since contact with the outside world was relatively recent for the Yup'ik, they were able to retain many of their traditional ways of life. Communities are still located along the water, and many families still harvest the traditional subsistence resources, especially salmon and seal. However, during the twentieth century when Western schools and Christian churches were built, the Yup'ik stopped telling their stories and offering their traditional words of wisdom. Their children were educated in Western languages and ways, and Christian churches taught their children religion; as the last shamans died no-one took their place. As the twenty-first century dawned, however, Yup’ik elders recognized that their lifestyle was almost lost. The elders chose to start sharing their wise words, believing that they have continued relevance and power to change lives. These words of wisdom are now available not only to educate Yup’ik young people and thus continue their culture, but are also offered to all for the benefit of human society around the world. The common ancestors of Eskimos and Aleuts (as well as various Paleo-Siberian groups) are believed by archaeologists to have their origin in eastern Siberia and Asia, arriving in the Bering Sea area about ten thousand years ago. By about three thousand years ago the progenitors of the Yupiit had settled along the coastal areas of what would become western Alaska, with migrations up the coastal rivers—notably the Yukon and Kuskokwim—around 1400 C.E., eventually reaching as far upriver as Paimiut on the Yukon and Crow Village on the Kuskokwim. The environment of the Yup'ik, below the Arctic Circle, is different from that of the barren, icy plains of the northern Eskimos. They lived mostly in marshlands that were crossed by many waterways, which the Yup'ik used for travel and transportation. Due to the more moderate climate, hunting and fishing could continue for most of the year. The Yup'ik had contact with Russian explorers in the 1800s, later than the Northern peoples. Unlike the earlier explorers of the 1600s who regarded the Arctic Eskimos as savages, these later Russians regarded them more favorably, allowing them to continue their traditional way of life with a focus on the extended family, and speak their own language. Russian Orthodox Church missionaries lived among the Yup'ik in the late 1800s; the Yup'ik selected elements of Christianity to integrate with their traditional beliefs. The Yup'ik people (also Central Alaskan Yup'ik, plural Yupiit), are an Eskimo people of western and southwestern Alaska ranging from southern Norton Sound southwards along the coast of the Bering Sea on the Yukon-Kuskokwim Delta (including living on Nelson and Nunivak Islands) and along the northern coast of Bristol Bay as far east as Nushagak Bay and the northern Alaska Peninsula at Naknek River and Egegik Bay. 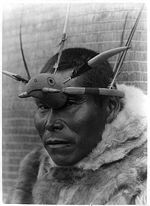 The Yupiit are the most numerous of the various Alaska Native groups and speak the Central Alaskan Yup'ik language. As of the 2000 U.S. Census, the Yupiit population in the United States numbered over 24,000, of whom over 22,000 lived in Alaska, the vast majority in the seventy or so communities in the traditional Yup'ik territory of western and southwestern Alaska. The Alutiiq (plural: Alutiit), also called Pacific Yupik or Sugpiaq, are a southern coastal people of the Yupik peoples of Alaska. Their language is also called Alutiiq. They are not to be confused with the Aleuts, who live further to the southwest, including along the Aleutian Islands. Through a confusion among Russian explorers in the 1800s, these Yupik people were erroneously called "Alutiiq," meaning Aleut in Yupik. This term has remained in use to the present day. Before European contact with Russian fur traders, the Alutiiq lived in semi-subterranean homes called barabaras, like those of their neighbor Aleuts. They lived a coastal lifestyle, subsisting primarily on ocean resources such as salmon, halibut, and whale, as well as rich land resources such as berries and land mammals. Chugach (pronounced /ˈtʃuːgætʃ/) The Chugach people are an Alutiiq people who speak the Chugach dialect of the Alutiiq language. They live in the region of the Kenai Peninsula and Prince William Sound. The Chugach gave their name to Chugach National Forest, the Chugach Mountains, and Alaska's Chugach State Park, all located in or near the traditional range of the Chugach people in southcentral Alaska. Siberian Yupiks, or Yuits, are indigenous people who reside along the coast of the Chukchi Peninsula in the far northeast of the Russian Federation and on St. Lawrence Island in Alaska. They speak Central Siberian Yupik (also known as Yuit), a Yupik language of the Eskimo-Aleut family of languages. The name Yuit (Юит, plural: Юиты) was officially assigned to them in 1931, at the brief time of the campaign of support of indigenous cultures in the Soviet Union. The Central Alaskan Yup'ik language lies linguistically between the Alutiiq and Siberian Yupik languages. These three languages are of Eskimo origin, but distinct from the Inupiaq language spoken throughout much of Alaska. Yup'ik (plural Yupiit) comes from the Yup'ik word yuk meaning "person" plus the post-base -pik meaning "real" or "genuine." Thus, it means literally "real people." The ethnographic literature sometimes refers to the Yup'ik people or their language as Yuk or Yuit. In the Hooper Bay-Chevak and Nunivak dialects of Yup'ik, both the language and the people are given the name Cup'ik. Of a total population of approximately 21,000, about 10,000 speak Central Alaskan Yup'ik; children in several of the villages grow up speaking Yup'ik as their first language. Alutiiq (Sugpiaq) is a variety of Yupik Eskimo, distinct from Central Alaskan Yupik, spoken in two dialects from the Alaska Peninsula to Prince William Sound, including Kodiak Island. It is closely related to Central Alaskan Yup'ik, and has two dialects: Koniag and Chugach. Of a total population of about 3,000 Alutiiq people, about 400 still speak the language. Siberian Yupik (also St. Lawrence Island Yupik) is spoken in the two St. Lawrence Island villages of Gambell and Savoonga. It is also spoken in nearly identical form across the Bering Strait on the tip of the Siberian Chukchi Peninsula. Siberian Yupik is a distinct language from Central Alaskan Yup'ik and Alutiiq. Of the total Siberian Yupik population in Alaska (1,100 people) about 1,050 speak the language. Children on St. Lawrence Island still learn Siberian Yupik as the first language of the home; among Siberian Yupik people in Siberia there are about 300 speakers, but children no longer learn it as their first language. The traditional way of life of the Yup'ik was semi-nomadic, following the seasonal variations in their environment. Hunting and fishing were subsistence activities. Commonly they hunted sea mammals, such as seals, walrus, and, until more recent times, whales. The gathering of plants and berries added variety to their diet. They also developed trade, initially with neighboring groups, and then with the Russians by the end of the nineteenth century. Boats, both single person kayaks and larger vessels, were used for transportation along the coast and on waterways; dogs with sleds were used for land transportation. Boys in kaiak - Nunivak from The North American Indian by Edward S. Curtis. Traditionally, Yup'ik families spent the spring and summer at fish camp, and then joined with others at village sites for the winter. Edible greens and berries grow profusely in the summer, and there are numerous birch and spruce trees in the region. In contrast to the Northern Eskimos who built igloos for shelter, the Yup'ik used trees and driftwood to build permanent winter homes, separate buildings for the men and the women. The men's communal house, the qasgiq, was the community center for ceremonies and festivals which included singing, dancing, and storytelling. 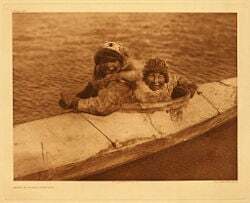 The qasgiq was used mainly in the winter months, because people would travel in family groups following food sources throughout the spring, summer, and fall months. Aside from ceremonies and festivals, it was also where the men taught the young boys survival and hunting skills, as well as other life lessons. The young boys were also taught how to make tools and qayaqs (kayaks) during the winter months. The women's houses, the ena, were smaller made of sod. They were usually located next to the gasgiq, and in some areas they were connected by a tunnel. Women taught the young girls how to sew, cook, and weave. Boys would live with their mothers until they were about five years old, then they would live in the qasgiq. Each winter, from anywhere between three to six weeks, the young boys and young girls would exchange, with the men teaching the girls survival and hunting skills and toolmaking and the women teaching the boys how to sew and cook. The winter building of Siberian Yupik, called yaranga (mintigak in the language of Ungazigmit Chaplino Eskimos), was a round, dome-shaped building, with a framework made of posts. In the middle of the twentieth century, following external influence, canvas was used to cover the framework. The yaranga was surrounded by sod or planking at the lower part. There was another smaller building inside it, used for sleeping and living. Household works were done in the room surrounding this inner building, and also many household utensils were stored there. At night and during winter storms the dogs were brought inside the outer part of the building. Villages consisted of groups of as many as 300 persons, tied together by blood and marriage. Marriage could take place beyond members of the immediate village, but remained with the larger regional group, as the regional groups were often at war with each other. The Yupiit believe that no one truly dies, but there is a cycle of life through which the soul of one who dies is reborn in another generation; that person is given their name. This cycle of birth, death, and rebirth also extends to animals. Like many indigenous cultures, the Yupiit had persons acting as mediators with the spirit world, contacting the various entities (spirits, souls, and mythological beings) that populate the universe of their belief system. These were usually termed “shamans” in the literature, although the term as such was not necessarily used in the local language. For example, the Siberian Yupik called these mediators /aˈliɣnalʁi/, which is translated as "shaman" in both Russian and English literature. The Yupiit believe in both benign and evil spirits. Those affected by evil spirits would suffer, often becoming sick. 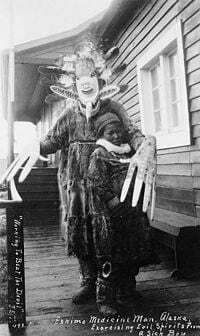 Ungazigmit people (the largest of Siberian Yupik variants) had /aˈliɣnalʁi/s, who received presents for shamanizing, or healing such afflicted people. This payment had a special name, /aˈkiliːɕaq/, in their language. In Yup'ik culture, spirits did not "force" individuals to become shamans, most Yup'ik shamans chose this path. Even when someone received a "calling," that individual might refuse it. The process of becoming a Yup'ik shaman usually involved difficult learning and initiation rites, sometimes involving a vision quest. Chugach apprentice shamans deliberately visited lonely places and walked for many days as part of a vision quest that resulted in the visitation of a spirit. The apprentice passed out, and the spirit took him or her to another place (like the mountains or the depths of the sea). Whilst there, the spirit instructed the apprentice in their calling, such as teaching them the shaman’s song. The boundary between shaman and lay person was not always clearly demarcated. Non-shamans could also experience hallucinations, and many reported memories of ghosts, animals in human form, or little people living in remote places. The ability to have and command helping spirits was characteristic of shamans, but laic people (non-shamans) could also profit from spirit powers through the use of amulets. Some laic people had a greater capacity than others for close relationships with special beings of the belief system; these people were often apprentice shamans who failed to complete their learning process. Amulets could take in many forms, reflecting Yup'ik beliefs about the animal world. The orca, wolf, raven, spider, and whale were revered animals, as demonstrated in numerous folklore examples. For example, a spider saves the life of a girl. Amulets could be used to protect an individual person or the entire family. Thus, a head of raven hanging on the entrance of the house functioned as a family amulet. Figures carved out of stone in the shape of walrus head or dog head were often worn as individual amulets. There were also hunting amulets, worn to bring success in the hunt. In the tales and beliefs of the Yup'ik people, wolf and orca were thought to be identical: orca can become a wolf or vice versa. In winter, they appear in the form of wolf, in summer, in the form of orca. Orca was believed to help people in hunting on the sea. Offerings, such as tobacco, might be thrown into the sea for them, because they were thought to help the sea hunter in driving walrus. It was believed that the orca was a help of the hunters even if it was in the guise of wolf, by forcing the reindeer to allow itself to be killed by the hunters. Siberian Yupiks stressed the importance of maintaining a good relationship with sea animals. It was thought that during the hunt only those people who had been selected by the spirit of the sea could kill a whale. Then the hunter had to please the killed whale: it must be treated as a guest. Just as a polite host does not leave a guest alone, similarly, the killed whale should not be left alone by the host (the hunter). Like a guest, it must be entertained (such as by drum music). It was thought that the prey of the marine hunt could return to the sea and become a complete animal again. That is why they did not break the bones, only cut them at the joints. On the next whale migration (whales migrate twice a year, in spring to the north and back in the autumn), the killed whale was sent off back to the sea in a farewell ritual. If the whale was pleased during its time as a guest, it was hoped that it would return again. Thus, future whale hunts would succeed. In similar vein, the traditional "Bladder Festival" reflects Yup'ik belief that the seal allowed itself to be caught by a worthy hunter, retracting its spirit into its bladder. Thus, Yup'ik hunters kept the seal bladders, and in the winter gathered them and hung them inflated in the gasgiq for five days. On the fifth day, each family took the bladders of the seals they had killed and pushed them through a hole in the ice so that the seals could be reborn in the ocean. 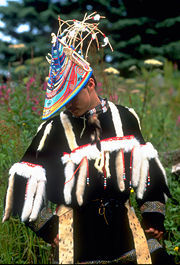 The Yup'ik are unique among native peoples of the Americas in that children are named after the last person in the community to have died, whether that name be of a boy or girl. Among Siberian Yupik it was believed that the deceased person achieved a certain rebirth through this giving of their name to the newborn. Even before the birth of the baby, careful investigations took place: dreams and events were analyzed. After the birth, the baby's physical traits were compared to those of the deceased person. The name was important: if the baby died, it was thought that he/she has not given the "right" name. In case of sickness, it was hoped that giving additional names could result in healing. The Siberian Yupik on St. Lawrence Island in the villages of Savoonga and Gambell are widely known for their skillful carvings of walrus ivory and whale bone, as well as the baleen of bowhead whales. These even include some “moving sculptures” with complicated pulleys animating scenes such as walrus hunting or traditional dances. Yup'ik group dances are often with individuals staying stationary, with all the movement done with rhythmic upper body and arm movements accentuated with hand held dance fans very similar to Cherokee dance fans. The limited movement area by no means limits the expressiveness of the dances, which cover the whole range from graceful flowing, to energetically lively, to wryly humorous. For the Yup'ik, masked dancing has long played an important role in ceremonies, traditionally performed inside the gasgiq. Often used by shamans to facilitate communication between the worlds of human beings and others, the masks make visible the world of spirits. As they were generally discarded after use, numerous specimens were retrieved by traders and collectors, and many are now found in museums. Representing a wide variety of animals, particularly wolves, seals, and loons, as well as legendary creatures, their masks have inspired collectors and artists. 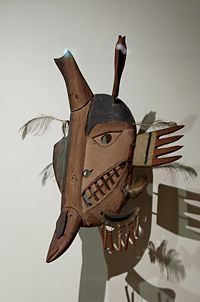 But their spiritual power, breathing life into the stories of the performers, is in many cases only a memory recalled by elders from the days when these masks were their "way of making prayer." Since contact with the outside world was relatively recent for the Yup'ik, they were able to retain many of their traditional ways of life. Communities are still located along the water, and many families still harvest the traditional subsistence resources, especially salmon and seal. The Alutiiq today live in coastal fishing communities, where they work in all aspects of the modern economy, while also maintaining the cultural value of subsistence, still following the long familiar seasonal changes in their environment. Art and music continue to be a significant part of their culture. Notable contemporary Alutiiq include painter and sculptor, Alvin Eli Amason, and Sven Haakanson, executive director of the Alutiiq Museum, and winner of a 2007 MacArthur Fellowship. The Yup'ik are not unchanged, however, but have adopted many modern conveniences. With the building of the Trans-Alaska Pipeline System they witnessed a major change to their environment and thus their way of life. Their gasgiq have given way to modern houses, with electricity and plumbing, and churches and schools perform the community functions. Still, though, there is an emphasis on the extended family as the basis of society. While some continue their traditional ways of fishing and hunting, many Yup'ik have taken jobs, often as government-employed workers. Many of the Chugach people are shareholders of the Chugach Alaska Corporation, an Alaska Native regional corporation created under the Alaska Native Claims Settlement Act of 1971. It is their traditions, their qanruyutet (wise words), their adages, words of wisdom, and oral instructions regarding the proper living of life that are key to the Yup'ik way of life. These distinctive wise words have guided the relations between men and women, parents and children, siblings and cousins, fellow villagers, visitors, strangers, and even with non-Natives. When the Western world brought schools, the Yup'ik trusted their children to that educational system and stopped telling their stories and offering their traditional words of wisdom. Christian churches taught their children religion, and as the last shamans died no-one took their place. As the twenty-first century dawned, however, Yup’ik elders recognized that their lifestyle was almost lost. Soon the last generation to have grown up in the communal gasgiq with these traditional words would have gone. The elders chose to start sharing these wise words during Elders Council gatherings and conventions, believing that they have continued relevance and power to change lives. Through these public, translated, and published proceedings, the elders hope not only to educate Yup’ik young people but also to offer their words of wisdom to all. ↑ Claus-M. Naske and Herman E. Slotnick, Alaska: A History of the 49th State, 2nd edition (Norman, OK: University of Oklahoma Press, 1987, ISBN 978-0806120997), 18. ↑ 2.0 2.1 2.2 Ann Fienup-Riordan, Boundaries and Passages: Rule and Ritual in Yup'ik Eskimo Oral Tradition (Norman, OK: University of Oklahoma Press, 1995, ISBN 978-0806126463). ↑ 3.0 3.1 3.2 3.3 3.4 Ann Fienup-Riordan, Eskimo Essays: Yup'ik Lives and How We See Them (Piscataway, NJ: Rutgers University Press, 1999. ISBN 0813515890). ↑ 4.0 4.1 4.2 Alaska Native Language Center, "Central Alaskan Yup'ik." University of Alaska Fairbanks (2001-12-07). Retrieved November 4, 2011. ↑ U.S. Census Bureau, "Table 1. American Indian and Alaska Native Alone and Alone or in Combination Population by Tribe for the United States: 2000." Census 2000. Retrieved July 15, 2008. ↑ "Table 16. American Indian and Alaska Native Alone and Alone or in Combination Population by Tribe for Alaska: 2000." U.S. Census Bureau, Census 2000. Retrieved July 15, 2008. ↑ Alaska Native Language Center, Alutiiq Alaska Native Language Center, 2008. Retrieved July 15, 2008. ↑ Alaska Native Language Center, Siberian Yupik/St. Lawrence Island Yupik Alaska Native Language Center, 2008. Retrieved July 15, 2008. ↑ Mihály Hoppál, Sámánok Eurázsiában (Budapest: Akadémiai Kiadó, 2005, ISBN 9630582953), 45–50. ↑ Georgy A. Menovščikov (Меновщиков), "Popular Conceptions, Religious Beliefs and Rites of the Asiatic Eskimos." In Popular beliefs and folklore tradition in Siberia, edited by Vilmos Diószegi, (Budapest: Akadémiai Kiadó, 1968), 442. ↑ Daniel Merkur, Becoming Half Hidden: Shamanism and Initiation among the Inuit (Stockholm: Almqvist & Wiksell, 1985, ISBN 9122007520), 125. ↑ Рубцова, tale 13, sentences (173)–(235). ↑ 23.0 23.1 23.2 Edward J. Vajda, Siberian Yupik (Eskimo) East Asian Studies. Retrieved July 12, 2008. ↑ (Russian) A radio interview with Russian scientists about Asian Eskimos Retrieved July 12, 2008. ↑ Ernest S. Burch, Jr. and Werner Forman, The Eskimos (Norman, OK: University of Oklahoma Press, 1988. ISBN 0806121262), 90. ↑ Ann Fienup-Riordan, The Living Tradition of Yup'Ik Masks: Agayuliyararput : Our Way of Making Prayer (University of Washington Press, 1996, ISBN 978-0295975016). ↑ Ann Fienup-Riordan, Hunting Tradition in a Changing World: Yup'Ik Lives in Alaska Today (Piscataway, NJ: Rutgers University Press, 2000, ISBN 978-0813528052). ↑ Sven Haakanson, Executive Director, Alutiiq Museum, Kodiak, Alaska. MacArthur Fellows 2007 The John D. and Catherine T. MacArthur Foundation. Retrieved July 2, 2008. ↑ Ann Fienup-Riordan, Wise Words of the Yup'ik People: We Talk to You because We Love You (Bison Books, 2005, ISBN 978-0803269125). Hoppál, Mihály. Sámánok Eurázsiában (in Hungarian). Budapest: Akadémiai Kiadó, 2005. (The title means "Shamans in Eurasia," the book is written in Hungarian, but it is also published in German, Estonian and Finnish). Krupnik, Igor, and Nikolay Vakhtin. 1997. "Indigenous Knowledge in Modern Culture: Siberian Yupik Ecological Legacy in Transition." Arctic Anthropology 34(1): 236. Menovščikov (Меновщиков), Georgy A. "Popular Conceptions, Religious Beliefs and Rites of the Asiatic Eskimos." Popular beliefs and folklore tradition in Siberia. Budapest: Akadémiai Kiadó, 1968. Рубцова, Е. С. Материалы по языку и фольклору эскимосов (чаплинский диалект) (in Russian). Москва: Российская академия наук, 1954. Transliteration of author's name, and the rendering of title in English: Rubcova, E. S. Materials on the Language and Folklore of the Eskimos, Vol. I, Chaplino Dialect. Moscow: Russian Academy of Sciences. Ludmila Ainana, Tatiana Achirgina-Arsiak, Tasian Tein. 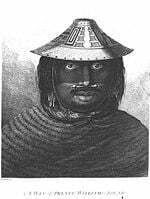 Yupik (Asiatic Eskimo). Alaska Native Collections. Поселок Унгазик (Чаплино) (in Russian). Музея антропологии и этнографии им. Петра Великого (Кунсткамера) Российской академии наук. Rendering in English: Ungazik settlement, Kunstkamera, Russian Academy of Sciences. Поселок Наукан (in Russian). Музея антропологии и этнографии им. Петра Великого (Кунсткамера) Российской академии наук. Rendering in English: Naukan settlement, Kunstkamera, Russian Academy of Sciences. This page was last modified on 7 July 2013, at 20:42.